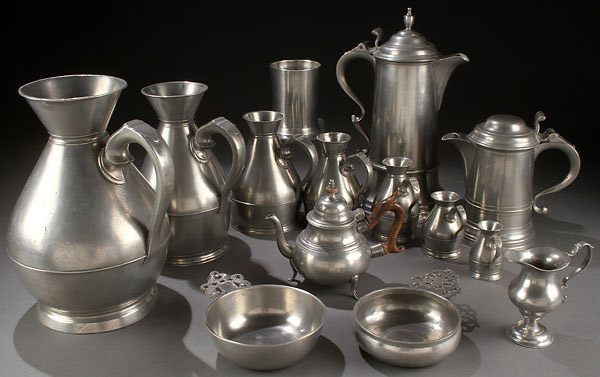 The sale will begin with an important collection of over 125 pieces of early American and Georgian pewter, with many fine examples by listed metalsmiths including Frederick Bassett, Thomas Boardman, Samuel Hamlin and Samuel Ellis. There is a good selection of forms including beakers, mugs, flagons and teapots. Other American decorative arts and primitives will also be sold on Tuesday, including furnishings, lighting, toleware and ceramics. 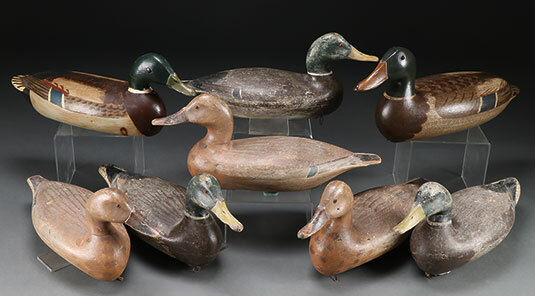 There is also an impressive collection of over 75 hand carved wooden decoys. Also being sold are Native American basketry and Southwest Native American weavings. Also being offered are over 50 hand stitched quilts and coverlets - a most impressive offering! Also being sold from the Hockridge estate is an impressive collection of American Civil War memorabilia with over 100 lots being offered. The lots will feature vintage firearms, edged weapons, accoutrements, badges, and more including a Civil War era saddle. If it is furniture you are looking for, this auction will not disappoint with over 50 pieces of furnishings including an early American mahogany highboy, Federal period tall case clock, blanket chests, Black Forest carved pieces and over 50 handwoven Oriental carpets. 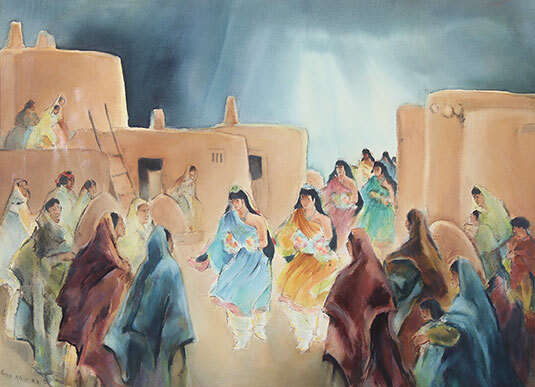 Additionally featured on this two day auction is over 75 pieces of artwork from listed artists including original oil paintings and prints by listed artists including an original watercolor titled "Corn Dance" by Gene Kloss (1903-1996). Also being sold is a spectacular Franz Bergman cold-painted Orientalist bronze lamp. If collectibles are more to your liking, this auction will really feature something for everyone. There are cast iron and tin litho character toys, Christmas items, Victorian figural napkin rings, over 300 vintage and early films in 16 mm and 8 mm, stereoviews, gold jewelry, animal trophies, and and elephant's foot stool. There is also a good offering of stamps and coins on this auction. Rounding out the auction will be sterling silver, over 150 pieces of European and English porcelain and ceramics including Meissen, KPM, Royal Doulton, and Dresden, American and European 19th and 20th century art glass including Tiffany, Steuben, Galle and others and over 140 lots of Chinese, Japanese, and South East Asian decorative arts including carved ivories, jades, bronzes, and export furnishings. Be sure to check out the online catalog and register to participate in this auction today. You won't want to miss it.